We’ve been making quite a few roasted chickens lately. They’re cheap, tasty, and can be stretched into several meals. 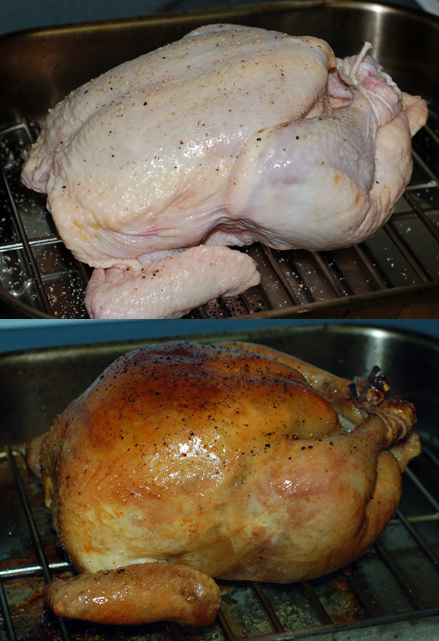 I use the Keller method for my chickens, so the prep work is pretty minimal: You just rinse and dry the chicken thoroughly inside and out, coat it liberally with salt and pepper, and truss it up, then it roasts at 450F until it’s done and the skin is brown and crispy. But I’ve talked about this in previous posts. I always have to make gravy to go with my chicken, and I think I’ve got the method down pat now. I move the chicken to a serving platter, tilting it first so all the juices flow out of the cavity, and cover it to rest while I make the gravy. Then I pour all the drippings and juices off into a small bowl, and add equal parts white wine and water to the roasting pan, enough to cover the bottom and release all those flavorful brown bits that stayed stuck on. Meanwhile, I skim the chicken fat off the drippings in the bowl, and reserve it separately. The liquid from the roasting pan and defatted drippings from the bowl are then poured through a strainer into a small saucepan, probably 3/4 C or less altogether for an ordinary chicken, with a dollop of Dijon mustard for flavor. While that comes back to a boil, I mix a couple tablespoons of the reserved chicken fat together with an equal amount of flour; this functions like a beurre manie and keeps the flour from lumping up in the gravy. I then add enough of the chicken fat slurry to thicken the gravy to our taste, and adjust it for seasoning if necessary; it generally doesn’t need any salt because the chicken was well-salted already. 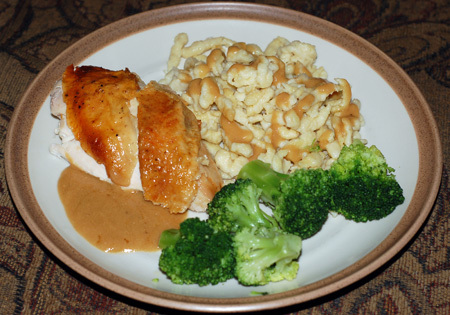 To go with this roasted chicken I made a batch of spaetzle, which my whole family loves. 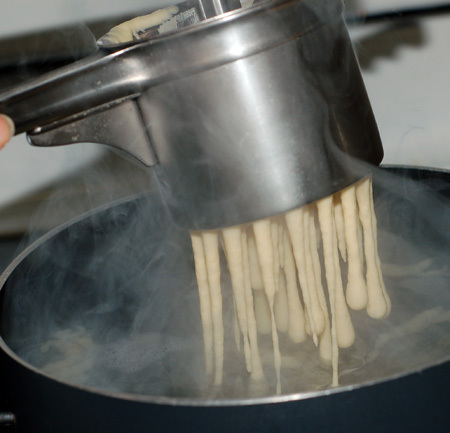 I’ve written up spaetzle before, but I wanted to include a picture of the ricer in action because it illustrates the texture of the batter I use. Once we’ve eaten dinner and picked all the usable meat off the chicken, I usually make a pot of chicken stock with the carcass. This couldn’t be easier, and the results are fantastic. I throw the carcass, along with any remaining drippings, bits of skin and sometimes the leftover gravy, into my crockpot and cover it with two quarts of water. If I’ve anticipated making stock, I might save all my vegetable peels and trimmings for a day or two, and keep it in a baggie in the fridge or freezer to flavor the stock. If not, I just quarter a whole onion (skin and all), and toss in a carrot or two and a few garlic cloves (plus some celery if I have it on hand). I also add a few whole peppercorns and bays leaves. Make sure everything is submersed in the water, and crank the crockpot up to high. I do this after dinner, and then turn the crockpot down to low before bed. The next day, I remove all the large chunks from my fresh stock with the help of a spider strainer, and pour the remains through a fine mesh strainer to catch the rest. If you are really concerned about impurities, you can line the mesh strainer with several layers of cheesecloth, but I generally don’t bother. I do find that any impurities settle to the bottom of the container, so I just pour carefully as I use the stock, and then throw out the last half cup or so when it starts looking sludgy. 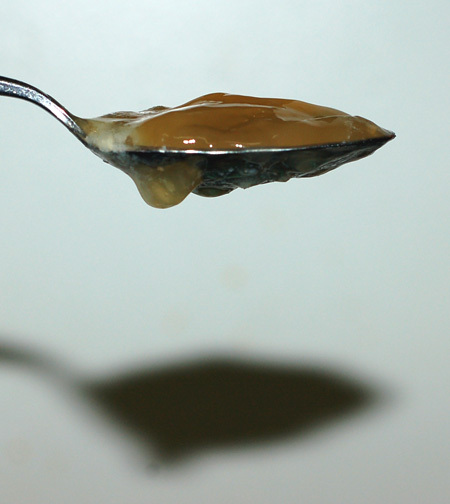 You can also easily remove the fat from the stock once it has cooled and congealed on top. Yes, I made homemade cheese tortellini in a two-hour marathon session. First, I made a batch of fresh egg pasta with my basic recipe. While the dough rested, I mixed up a simple filling of 3/4 C ricotta cheese, 1/2 C grated Parmesan, 1 egg yolk, salt/pepper and a hefty sprinkle of Italian herbs (Penzey’s pasta sprinkle, in this case). Then I divided my dough into 6 pieces, and ran them through the pasta roller one at a time until nice and thin (the rest held under plastic wrap to keep from drying out). 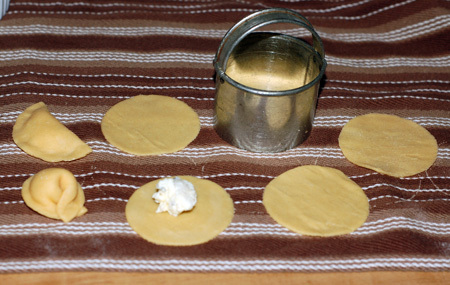 Next I cut out circles of dough with a small biscuit cutter, about 2″ in diameter, and brushed the edges of each circle with egg wash made from the yolk’s companion white. A tiny dollop of cheese filling, no more than 1/4 tsp for this size pasta, and I was ready to shape. Each circle was folded in half and the edges carefully sealed together, then the corners of the half circle were pressed together one on top of the other, with another tiny dab of egg wash.
Four or five dozen tortellini later, I made a simple soup base with sauteed onion, carrot and garlic, about a quart of the fresh stock, and a handful of chopped broccoli for good measure. When the veggies were tender, I added some of my tortellini and cooked them just for a few minutes, until they were cooked and heated through. I meant to add some shredded leftover chicken, but forgot until after we had started eating. 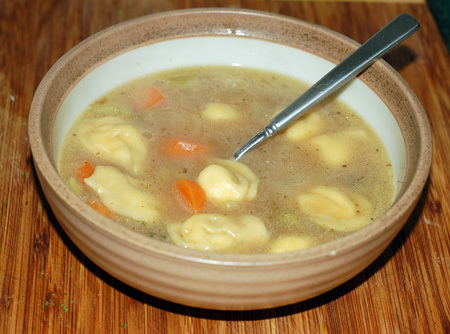 I thought the soup was delicious, and I was so impressed that the tortellinis looked just like the store-bought sort. My son mushed his up into tiny bits without eating because he had been snacking on cereal, dried fruit, and a banana muffin for the past hour as I shaped pasta. 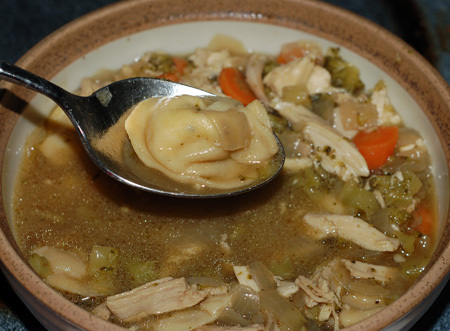 My husband ate the tortellini out of his broth and left the rest, complaining about the “lack of protein” in the soup. (Really? Egg pasta stuffed with cheese, floating in a fresh, gelatinous stock?) Oh well—more for me! 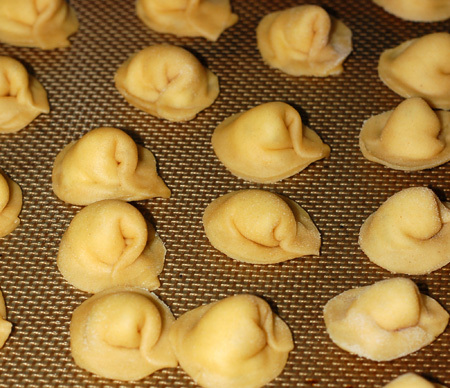 I squirreled away about half of the remaining uncooked tortellini in the freezer for use in the near future, even if I’m the only one who wants them. 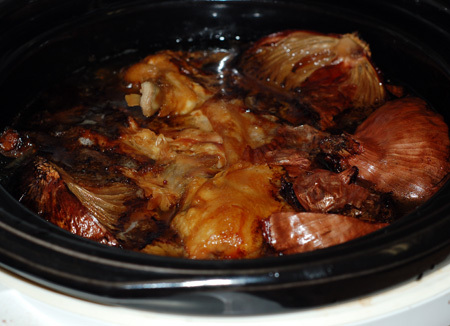 Update 8/11/10: I now add a tablespoon or two of apple cider vinegar to the crockpot when making stock, which helps to release more minerals from the bones into the broth. 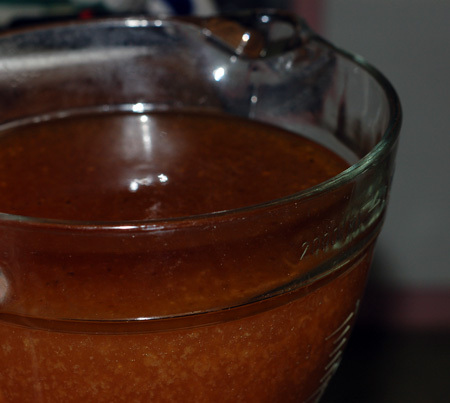 I’ve also noticed that my stock only seems to gelatinize properly when I use a whole carcass from a roasted chicken; saving the raw bones after breaking down a chicken into parts, even if I roast the bones before simmering, has never yielded that same texture. A few more notes: Leaving the skin and fat with the carcass when making stock allows a nice thick fat layer to form on top of the broth once chilled; this acts as a seal and allows me to store my broth in the refrigerator for a few extra days before freezing, if necessary. If the heart and gizzards are included with the bird, I throw them into the stock; I also now trim and store the livers in a freezer baggie, to use in recipes once I accumulate enough, and the large fat pads by the thighs to periodically render into schmaltz.